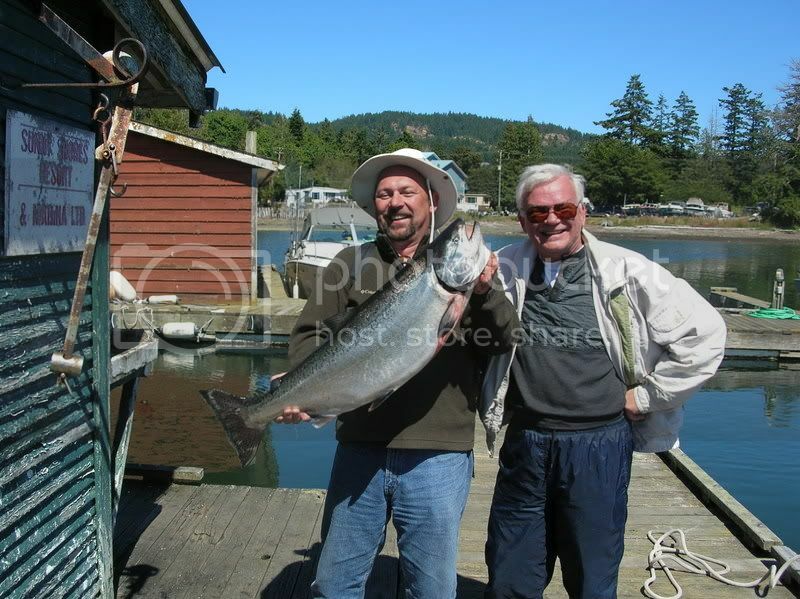 The fishing reports for Sooke continue to be hot and cold, or maybe lukewarm overall. There's a few fishing being caught, but also a fair number of boats coming home skunked. Those putting in the hours and a little bit of luck are bringing home some beauties. Steve Demianchuk caught his first Tyee on Sunday morning between Possession Pt and Secretary. He reports the 32 pounder made one long good run and then charged the boat. It saw the boat, sounded for a bit, then came to the surface. Steve, a fairly new resident for Sooke says "I'm totally hooked! This living in Sooke thing could be very good!" No doubt about it, one of the best places on Earth. Neil from Salty Towers was out on Saturday for a quick fish before a friend's wedding. He hooked into two that he reckons were 25-35 pounds, right off Secretary. The first was lost due to pilot error, guest gripped that knucklebuster a bit tight and the mainline snapped (ouch). Second lost to a seal, just 50 feet off the Island. Reports of an first light bite off Sheringham, for those willing to get up really early and travel in the dark. You do what you have to do, to get that fish of your dreams aboard. Foggy mornings, welcome to "Fog-ust", so get that GPS and radar running, and motor safely.